Brandon Lee Adams & Johnny Staats. Adams & Staats. Flatpicking & mandolin mastery. Two masters. One stage. Ireland. October 2019. Brandon Adams is the real deal when it comes to bluegrass and true country music. A clear heartfelt singer with strong original songs, and an excellent guitarist. A singer/songwriter and guitarist very much of the Tony Rice school and hailing from the hills of Appalachia, Brandon Lee Adams traces his musical roots from traditional gospel music all the way to folk, jazz, and blues, but it is bluegrass and acoustic music that have had, & continue to have, the deepest impact on him. An up-and-coming artist he may be, but Adams has already appeared on two GRAMMY-nominated albums and one IBMA award-winning album (the Skaggs Family Records double CD Celebration of Life). He played the Ryman Auditorium as a teenager and has recorded and/or shared the stage with a Who’s Who of iconic artists including his hero, the aforementioned Tony Rice, J.D. Crowe, Kitty Wells, Don Rigsby, Art Stamper, Ernie Thacker, Dave Evans, and many more. On 2014’s highly acclaimed Hardest Kind Of Memories, his first full-length release of mostly mainstream contemporary bluegrass, he worked with top grassers Scott Vestal (banjo), Randy Kohrs (dobro), and Luke Bulla (fiddle); while 2018’s Time That I Was Leavin’ saw him sharing the studio with Sammy Shelor, Carl Jackson, and Forrest O’Connor. When I listened to the song we recorded…. it was one of the few times that I missed my voice. Seeing himself more as a story teller who happens to play an instrument and with chops to rival anyone, Adams proves worthy of the praise he receives each time he graces a stage with his virtuosic, melodic, and lightning-speed guitar playing and deep, rich country voice. A multi-award-winning multi-instrumentalist, Johnny Staats established his musical dominance throughout the latter half of the 1990s thanks to a string of wins at the prestigious Vandalia Gathering Mandolin championships in his home state of West Virginia. A major label recording career followed, somehow facilitated around his day-to-day commitments as a UPS package delivery driver. The first release from ‘the mandolin-playing UPS driver’, 2000’s Wires and Wood, a set consisting primarily of Staats’s original music collaborating with such luminaries as Sam Bush, Scott Vestal, Jerry Douglas, John Cowan, Jim Hurst, and Tim O’Brien, quickly became the talk of Music City & garnered him international acclaim by demonstrating to a new and varied worldwide following Johnny’s vocals, astonishing guitar and mandolin speed, and creativity. In his hands, the mandolin soars and glides, pops and hisses, astounds and amazes. The school of Bill, Sam, and Dawg has a new honors graduate. There was national recognition too with regular performances on the hallowed stage of the Grand Ole Opry; high-profile appearances on NBC’s “The Today Show,” CNN’s “Larry King Live,” the CBS Evening News, & CMT Country Music Television; and favourable exposure in national press – the New York Times described the release as “Bewitching”, “Dazzling” said USA Today, while “Astonishing” was the New York Post’s adjective of choice. 2013 featured a Bluegrass Ramble after-hours showcase performance at the World of Bluegrass in Raleigh, NC, and also saw the release of his full-length follow-up Time Moves On, another helping of mostly Staats compositions, a more traditional bluegrass sound combined with country and blues influences. A gifted, musically agile and versatile duo looking to expand live performance opportunities and experiences, Adams & Staats are excited to be coming to Ireland to perform for an Irish audience. 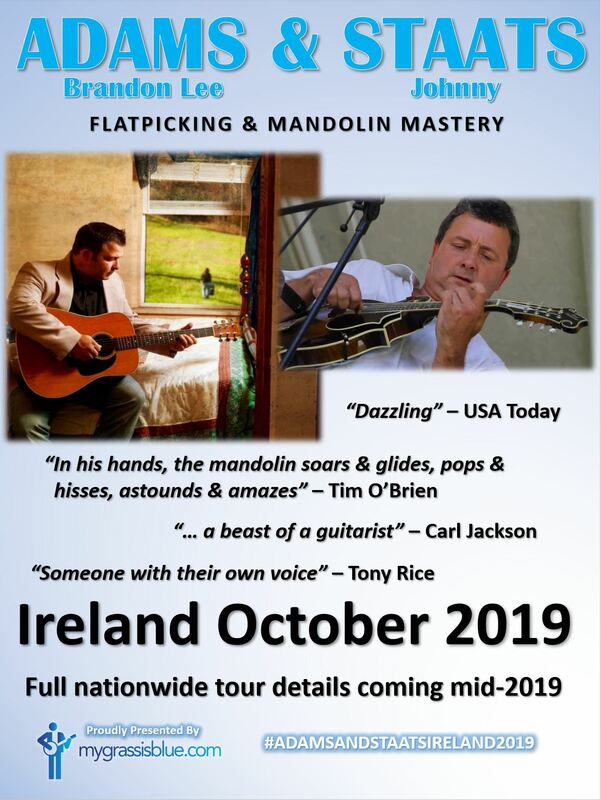 A full nationwide tour is scheduled for October 2019. Tour details, including dates and venues, will be announced here in mid-2019. The official music video for the title track from 2018’s Time That I Was Leavin’ featuring Sammy Shelor, Carl Jackson, and Forrest O’Connor. A mighty fine guitar instrumental piece, Brandon’s take on the Earl Scruggs classic ‘Reuben’. Brandon’s transcendent cover of Randy Newman’s “I Think It’s Going to Rain Today” as played on a new D-18 built by the Pre-War Guitar Company for the Fretboard Journal. In this performance Staats, accompanied by Dave Vaughn on guitar, sings of the hardships faced by generations of coal miners working in West Virginia. As part of the Mandolin Mondays series, Johnny playing a Staats original ‘Jessica’s Lullaby’ on his Aleyas Instruments Lee Chapman mandolin. Johnny putting a Aleyas Instruments mandolin #17 through its paces via a medley of tunes.